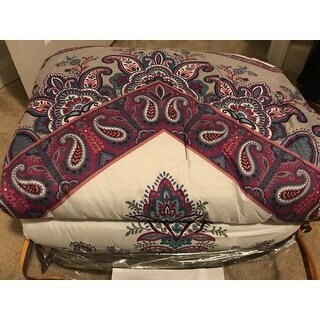 I love this pretty purple paisley design bed in a bag, it even has a small decorative pillow that came with it, as well as the pillow sham for a regular size pillow. Nice comfortable & not too heavy comforter. Invite boho vibes with vivid colors with the Intelligent Design Layne Complete Bed and Sheet Set. This ultra-soft microfiber comforter flaunts a large damask design that is broken up by an oversized chevron motif. Floral accents in gorgeous purple hues soften the look and give it a boho feel. A dark purple reverse and bed skirt complement the elegant print on the top of bed, while matching sham(s) with an embroidered white border creates a chic coordinated look. One decorative pillow with floral embroidery provides the perfect touch. To finish the ensemble is a complete sheet set, with printed elephants, to pair beautifully with the comforter. Machine washable for easy care, this complete bed and sheet set will easily transform your bedroom into the perfect abode. It's very beautiful. Adds a nice touch to my guest room. However, I can tell the comforter will not last long. It's a poor quality and I am afraid to wash it. I am worried it will be lumpy. Love this bed comforter and all the pillows and sheets. My granddaughter was delighted with the set! I bought 2 of theses comforters for my daughters room which holds two twin beds. The purple color is so pretty,glad I purchased it. It is so comfortable, I would recommend this item. My 9 year old daughter loves this comforter set! It goes perfect with her light purple room and makes her room look more grown up. The design is beautiful and the quality is good also. We would definitely recommend this comforter. Very pretty! Bought this set for my daughter for college. It’s super cute, the colors are really pretty. The material seems soft andI love the elephant sheets. The comforter isn’t too heavy, which is ok because she might get a dorm without AC. In the winter you can just add more blankets. My daughter can’t wait to use it. Very nice soft comforter that fits the size bed I ordered hangs off each side not to short, sheets tuck in under a thick mattress and hold nicely. Colors as pictured looks very nice and feels of nice quality. Love how the comforter looks on my silver shiny bed set. The color was exactly what I expected. Wish the were matching drapes to go with the set. Not happy at all. This was a gift for a friend who redid her bedroom in purple. The sheets are blue with elephants on them, the shams and bed skirt are wine colored and the quilt has very little purple. She said it was fine but I was very embarrassed and I will not order again. Really nice set for the money. Sheets are soft, comforter is lightweight, but warm enough. Bought it for my daughter who lets the pug sleep with her, and it doesn't show the dog hair. pretty and exctly as advertised. Was pleasantly surprised! Purchased this for my daughters' room and she couldn't be happier! Would definitely recommend. This set is absolutely gorgeous !!! My granddaughter love it!! All in one with sheets and quilt. Its in purple which is hard to find.